This is where news/diary items from the Langford Home Page go to die. 31 December 2007 Happy New Year!  To mark the end of an often difficult year, here's a somewhat scrappy issue of the increasingly infrequent Cloud Chamber. 25 December 2007 Hazel and I wish you all a jolly good time. Thanks to everyone who sent cards, e-cards, festive greetings and dead cats. You know who you are. No thanks to the yobs who took advantage of seasonal fog and gloom to crack the lock of our garden shed with a pair of bolt-cutters. The revealed hoard of firewood and rusty old tools must have given them such a warm Christmassy thrill.  Suitably inappropriate reading for Yule: Eric Thacker's and Anthony Earnshaw's "graphic novel" Wintersol (1971 -- a follow-up to their Musrum), which reveals the true nature of that bad, selfish man Father Christmas and concludes: At all events, it is Wintersol that conceals the amethyst of our sobriety, Wintersol that frames the portrait of our doom, Wintersol that preserves the poisoned victuals of our ultimate meal. / Wintersol is the Magnetic Pole that woos our compasses, needling us with false portents of a Christmas that can never be. Have a nice day! 16 December 2007 Nostalgia time. Here, unearthed from boxes of 35mm slides taken long, long ago, are some shots from my very first science fiction convention: Novacon 3 in 1973. 13 December 2007 Here's a memento of the Reading SF Group Christmas dinner at a Thai restaurant, where several of the festive crackers contained the same joke in Danish: Hvad kalder man en hund uden ben? -- Det er sku'lige meget -- den kommer alligavel ikke når man kalder. Oh, how we all laughed. My wild guess was that it was the traditional "My dog's got no nose ..." Martin Hoare could not be restrained from phoning a Norwegian sf fan and demanding instant translation. "What do you call a dog with no legs? -- It doesn't matter; it won't come anyway." Good to know that the iron law of cracker mottoes -- that they must not actually be funny -- extends to Scandinavia. 12 December 2007 Everyone is telling me Terry Pratchett's bad news, which I also heard from the man himself. May he be one of the lucky ones.  Little brother Jon is interviewed in Crawdaddy. 9 December 2007 I fear that my prime New Year resolution will have to be to stop apologizing for sluggish updates here. Even I am getting bored with explanations that I was busy, I forgot, I was away from home, the FTP server caught Dutch Elm Disease and the rats in the walls ate my homework.  A recent "invisible" change at Ansible HQ is the introduction of some laziness-encouraging scripts in the various event listings, which cause items to vanish once past their sell-by date. Now you'll have to check View Source to find whether I actually updated the page or just let my bots do it for me.  Christmas cards and other seasonal goodies are beginning to arrive: thanks to all who keep sending these despite my habitually torpid lack of response. Much gratitude too to the Australia in 2010 Worldcon bid for presenting me with a nifty little enamel badge in recognition of some valuable but forgotten service, possibly just giving them money. Bruce Townley points out that those of Pastafarian leanings can now almost effortlessly blitz their friends with holiday e-cards featuring the Flying Spaghetti Monster and his noodly appendages. Bah! Humbug! 1 December 2007 Today, Ansible 245 was committed to the post and the ether. Special thanks to Gregory Benford for letting me see and quote from tributes to the late Sidney Coleman which he's publishing elsewhere. I wish there'd been room in my print edition for this: There were many Sid stories. One was about being at a physics meeting where Stephen Hawking spoke up from his wheelchair. This was around 1976, when Stephen could barely control his throat, and struggled to make his points in his semi-unintelligible way. His comment contained a detail, abstruse mathematical argument and went on for minutes. Sid said that he was tempted to reply, "That's easy for you to say," but held his tongue. 23 November 2007 Now I'm all alone in this big scary house, because Hazel's father (complete with new cyborg hip) was released from hospital surprisingly early and she's looking after him at his home. What unsupervised naughtiness can I get up to? To stoke the furnace of irresponsibility, here's a royalty cheque (check, rather) from E-Reads, with an ebullient publisher's circular announcing that "E-Reads' activities took a sharp turn upward in the third quarter of 2007 ... e-books have moved into the mainstream ..." Sure enough, this version of The Space Eater earned me $3.37 in the relevant period -- which extrapolates to $13.48 a year! Pity about the exchange rate. 19 November 2007 Argh. Here's the new issue of SFX, #164 dated Christmas 2007, and I find that the Langford column -- in which I drone on about odd books -- contains a plug for Edward Gorey's graphic collection Amphigorey Also. Of course I meant to type Amphigorey Again, the new(ish) book of work still uncollected when he died. The complete sequence is: Amphigorey (1972), Amphigorey Too (1975), Amphigorey Also (1983) and Amphigorey Again (2006). All highly recommended, though in the last I suspect Mr Gorey wouldn't have wanted two of his tiny art books (Q.R.V. aka The Universal Solvent and 10 Impossible Objects) to be reduced to single-page selections by the low trick of leaving out several drawings. 18 November 2007 Much relief after jitters: my father-in-law (who is 84) came through his hip operation in good shape, and amazed the nurses -- who had repeatedly told him that he wouldn't want any food for the rest of Saturday -- by downing a full dinner. Today Hazel's visiting him at the Nuffield Hospital near Oxford, and I am all alone with my computers and crosswords. I think I may allow myself a lunchtime drink.  Does anybody know why the Site Update Log keeps reporting phantom comments? If a post has two or more comments there's usually something there, but all too often "1 Comment" proves to mean no comment. 17 November 2007 Last night, in a simple but moving ceremony in a Reading pub (The Retreat), Martin Hoare at last presented me with the 2007 Fanwriter Hugo -- as carefully packaged in early September and shipped by slow boat from Japan. An appreciative audience of Retreat regulars said things like, "What the hell is that?" Ultraman looks bloody impressive on the mantelpiece, I can tell you.  General nervous finger-crossing today as Hazel's father awaits his hip replacement operation. May this be as utterly routine and uneventful as everybody tells us. 14 November 2007 Well, well: on 2 November I uploaded the computer columns book (see 13 November) to Lulu.com, yesterday I had email saying it was being shipped, and now the first copy is here. Doesn't look too bad, either, though I'm treating this as bound page proofs and tinkering further before the general public is allowed into the building. The Museum of Computing at Swindon is actually keen to have a copy! 13 November 2007 Much assorted busyness since Novacon. At the convention I was presented with a copy of that august journal of record Banana Wings, containing the previously mentioned article on A.P. Herbert's "Misleading Cases". This will no doubt turn up in my next nonfiction collection; for the present, seekers after truth will have to be content with the obsessive bibliographical notes rather than the article proper.  That nice Gordon Van Gelder at F&SF has accepted another Langford "Curiosities" piece, exhuming Dornford Yates's forgotten fantasy novel.  I think it's time for the remaining Ansible Information software to be taken off the market -- just as soon as I can muster the energy to update those pages. Which reminds me that, for the benefit of about half a dozen people who remember the technology, I've been assembling a book of my 1980s computer columns for Apricot File magazine. This is more an exercise in learning how to use Lulu.com than a money-making venture, but fanatical Langford completists will of course be permitted to buy copies (with suitable caveats about the plethora of really old technical information larded with even older jokes). Watch this space. 30 October 2007 Having reviewed Ben Bova's strangely retro-sf The Aftermath for SFX, I feel considerable sympathy for Adam Roberts's response to a earlier Bova space epic, Titan, and its John W. Campbell Memorial Award win. Even kindly Mark R. Kelly of Locus Online can't help thinking that this was a career award for the Right Sort of Chap, rather than anything related to the quality of the actual book. 19 October 2007 Jaded though I may be after 27 years of freelancing, any new appearance in print still brings cheer: this week I received the December F&SF with yet another Langford Curiosities column, and the October New York Review of SF with a transcript of my speech at the Harry Potter convention in July. These were more or less expected treats, but I was boggled to discover that Gollancz's latest Gene Wolfe reissue (from a review consignment that arrived today) has a blurb quotation from me on the back, nestled between a couple of major US newspapers and Ursula K. Le Guin. Fame at last! However, I'm not sufficiently wise in the ways of publishing to understand why a one-volume edition of The Book of the New Sun should be called Severian of the Guild. The Frank Herbert classic in the same box was not retitled Paul of Arrakis, and although there is canonical authority for it, I don't believe any Tolkien reissue has actually appeared as Frodo of the Nine Fingers and the Ring of Doom. 11 October 2007 Hung be the heavens with black, yield day to night! Comets, importing change of times and states, Brandish your crystal tresses in the sky, And with them scourge the bad revolting stars ... Or to put it another way, my little brother Jon -- the rebellious young rock star -- has his 50th birthday today. 5 October 2007 Today's achievement is an especially Thogful issue of Ansible. Together again for the first time: Dan Brown, Gardner F. Fox and Stephen R. Donaldson! 24 September 2007 Analystic. Argence. Assoiled. Barranca. Bayamo. Brume. Brunt (as verb). Caliginous. Cataphract. Cerements. Chancres. Chrysoprase. Clench. Condign (also, uncondign). Crepuscular. Cymar. Cynosure. Deflagration. Delirancy. Delinition. Delitescent. Devoir. Eldritch. Epitonic. Etiolating. Exigent. Flamberge. Frangible. Fug. Fuligin. Fulvous. Geas. Inexculpate. Innominate. Insequent. Jacinth. Jerrid. Knaggy. Lacustrine. Lambent. Leal. Lenitive. Limned. Lucent. Mien. Numinous. Oneiric. Orogenic. Paresthesia. Phosphenes. Puissance. Puissant. Roborant. Salvific (as in e.g. "salvific unction"). Sequacious. Stridulation. Sopor. Surquedry. Theriac. Theurgy. Threnody. Vizard. Vlei. Were-menhir. Writhen. Yes, I've been reading Stephen R. Donaldson's latest Covenant epic, Fatal Revenant. "Eldritch" seemed to be the front-running favourite for a long time, but was I think overtaken by "theurgy"; also very popular are "cymar" (because a character who wears one keeps reappearing), "flamberge" (because a character who wields one ...), "innominate", "lucent" and "puissance". As for the similes, they are annealed like granite, as ultimate as ebony, as sharp and pointed as augury, as ready as knives, as obdurate as travertine, as profound as orogeny, as fervid as a bonfire, as gravid as an aftershock, and indeed full of long shadows like striations of augury. "Loud forms twisted and squirmed around her, evanescent as tendrils, dangerous as tentacles; but an eerie delinition prevented her from hearing them clearly." For some reason I'm feeling slightly delirious -- that is, afflicted with delirancy. 18 September 2007 Another gap. Various upheavals at Langford HQ. One was a pleasant change from the usual sf routine: somehow I found myself trying to sort out the tangled bibliography of A.P. Herbert's once-famous "Misleading Cases" as collected in book form, which led me to write a longish article on the phenomenon. Where will this appear? I don't yet know for sure, but watch this space. Meanwhile, I have probably never mentioned here that most of my paltry savings are in an account at Northern Rock. Oops. 5 September 2007 Two points I forgot to mention in yesterday's issue but have since added to the online version: Ursula Le Guin's "On Serious Literature" was reprinted in Harper's magazine with her permission and (which tickled me) a credit to Ansible. And numerologists may wish to know that owing to past quirks of numbering, this is "really" the 250th issue. 4 September 2007 Another Ansible is scattered to the wind's twelve quarters. As noted, the SFWA vs Scribd.com affair led me to discover a Scribd upload of copyright material from George Hay's The Necronomicon, in which I have a quarter share. Polite email duly sent to Trip Adler of Scribd: "Although the user seems to be under the impression that it's legitimate to post the portions which pretend to be translations of an ancient book, these were of course invented for the George Hay project and remain in copyright." I'll report any response. Later: someone else finds that reports of copyright violation are not apparently welcome at Scribd. 2 September 2007 Further thanks to everybody for the various congratulations. John Scalzi (he who was, alas, one vote short) is a good egg and sent cheery email, confounding some people's expectations. The Hugo trophy represents Japanese superhero Ultraman, who made multiple appearances at the presentation, fighting rubber-suited monsters and presenting the drama Hugos with equal aplomb. 26 August 2007 This weekend, many of my science fiction fan friends are flying to the imminent World SF Convention in Japan, while I stay home and try to ignore the 240,000 extra people in town for the Reading Festival. Martin Hoare, as always, is representing me for the Fan Writer Hugo, and Chris O'Shea for Semiprozine: I generally offer the latter thankless task to the TAFF winner at US Worldcons, and Chris is being subsidized by the one-off equivalent JETS. A tiny voice tells me that the various ways in which the Japanese Worldcon will be different may include the breaking of my legendary Hugo streak. It has to happen some time! 23 August 2007 Checking (as one does) my Wikipedia entry for errors, I found that some anonymous hand had inserted a tribute to An Account of a Meeting with Denizens of Another World, 1871 -- since removed, alas, for lacking the "neutral point of view". Let me rescue it here: As a direct result of "Denizens," Langford has, in effect, redeemed a major portion of Western Civilization from its current tendency toward dour factualism and, as well, created a perfect artefact which could, if found by future "denizens" of this planet, cause by itself a re-introduction of terms like "mirth" and "playfulness" into the language if it lacks them at the time. And this is no small accomplishment. Indeed, no one can ever make a similar claim for John Milton. Now who could that have been? Someone at rr.com, if the IP address lookup can be trusted. Thanks, anyway! 21 August 2007 A day of celebration and champagne! After years and years of tiny royalties which were effortlessly blotted up by the e-reads.com "negative advance" (a notional setup fee to cover the cost of all those electrons), the e-book of The Space Eater has generated its first royalty cheque. I shall try not to spend the $11.67 all at once.  Those nice people at The New York Review of SF will be publishing my speech from the Harry Potter convention -- probably later this year.  Is anyone out there fond of my novel The Leaky Establishment? Though generally phlegmatic about taking the rough with the smooth when being reviewed, I've grown a little tired of seeing the customer reviews at Amazon.com headed by such a disagreeable one. Hint, hint....  Speaking of reviews, it's time to continue ploughing through my current SFX assignment, Sandworms of Dune. I may be gone for some time. 10 August 2007 Since the last entry I've been working: a column for SFX, a batch of SF Encyclopedia updates from John Clute and Gary Westfahl to be formatted, inserted and linked, a review for SFX (Hunter's Run by George R.R. 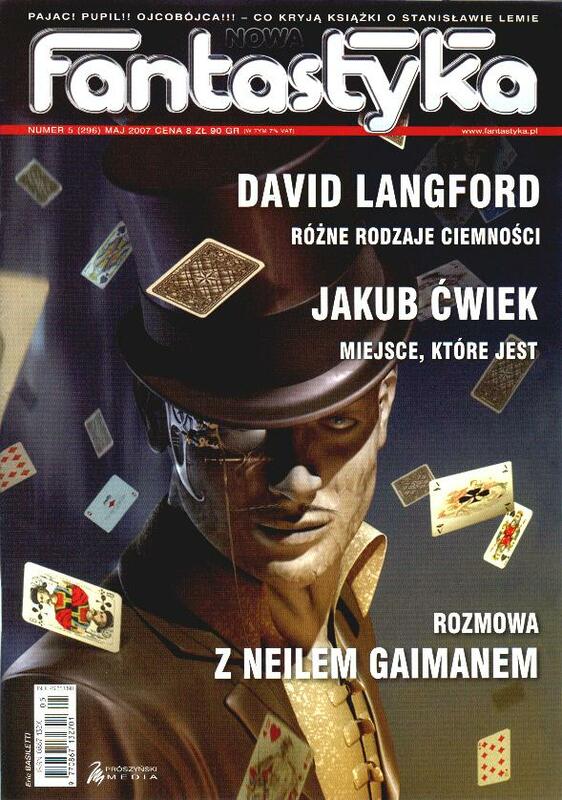 Martin, Gardner Dozois and Daniel Abraham), a book introduction for PS Publishing (The City in These Pages by John Grant), a new tranche of SF Encyclopedia videogame entries by Neal Tringham, and the regular "Ansible Link" column for Interzone. Somewhere in there I also managed to produce the August issue of Ansible. God knows how. September already seems worryingly close.  Later: Both PS Publishing and John Grant are happy with the book introduction. Phew.  Later still: My curse on the Reading market computer stall (5 August) is hereby withdrawn. I went back on Wednesday and came away with a replacement hard drive identical in every respect, including the "not working" part. Today I paid a third visit, and after some actual testing ("Oooh, this one seems to be dead. And this one too! Well I never," etc) I made off with a replacement of somewhat higher capacity than I'd originally paid for. Which works. At last. 5 August 2007 More distractions. I've been tinkering with an ancient Windows 95 system kept here for software compatibility checks, which -- extreme neep-neep tedium alert! -- had run out of space on what had once seemed an enormous 2Gb hard disk. (I also remember my first ever hard-disk PC and the awestruck sense that one would never fill up the yawning emptiness of its 10Mb drive. But Bill Gates came to the rescue there.) My cunning plan to fix this involved a larger drive, the Xxclone software, and a couple of those dinky little hard drive enclosures that plug into USB ports. Things I learned: (1) Xxclone works, but not with Windows 95 or 98 -- you have to run the software on an XP system. Not a problem. (2) A super-cheap HDD holder from an eBay dealer costs much the same, once you've added VAT and carriage, as a non-cheap one from the local computer shop. Indeed, not long ago I ordered some memory sticks on the assumption that the £7 carriage charge meant this was an outfit that sent everything by courier, only for the goods to arrive loose in a jiffybag with 70p postage. But I digress. (3) That chap with the computer stall in Reading market is still selling "checked" and "tested" hard drives that don't actually work, rot him. (4) Tiresomely, Xxclone doesn't do the whole job of making a cloned Win95 drive bootable, despite the presence of "Cool Tools" to do just this. You have to fiddle around with an emergency boot floppy and Sys.com. Whereupon I realized that, this being so, I could have used my own home-made backup software plus Sys.com, and not bothered with Xxclone after all. That's my life.  And now I've cast all likely readers into a profound slumber, I will mention very very quietly that I did indeed read the seventh Harry Potter book and was relieved that it contained remarkably few embarrassments for the author of The End of Harry Potter? Others who have finished HP7 should be able to identify the point at which I groaned aloud, "Oh no, it's going to be Deeper Magic from Before the Dawn of Time!" 21 July 2007 OK. I am now in post-Harry Potter mode. I'll get around to reading the new book eventually, but won't be studying any synopses (I gather it was all on Wikipedia within hours) before then.  Getting into London yesterday was quite terrifying. Doom-laden, even. The stations were leaking -- huge downpour through the roof at both Reading and Paddington -- and so were the trains, at all the joints between carriages. Getting out again was worse, with lots of the usual fast trains to or through Reading cancelled because it had been a bit wet. The sun had come out at 1pm, the whole afternoon was hot, and still all this horror was lying in wait in the evening. Bloody hell. I thought we rain-lashed inhabitants of a soggily sceptred isle were ready for stuff like that. It must have been (all together now) the wrong sort of rain.  The Sectus audience was kind to me and laughed in most of the right places; a few of them even wanted autographs. Although this Potter event -- like at least one early Discworld con -- didn't cater much for general socializing ("Where's the Green Room as advertised?" "Oh, we decided not to have one. "), and the University of Westminster venue seemed to be an alcohol-free zone, there was a convenient, enjoyably old-fashioned pub called The Ship just up the road. Nudge nudge, wink wink, say no more. I was not the only attendee to discover this alternative Green Room. 20 July 2007 Last night I was at the opening of Sectus 2007. More of this later, or somewhere else. Today is stage fright day, since I need to travel into London again to give my talk (as below): "Hogwarts Proctology Class: Probing the End of Harry Potter". Not as exciting as it sounds, alas. Hope there's a break in the current (9:30am) heavy rain.... If I misjudge my merry quips about boy wizards, I expect the lynching will take place around 4pm. No, I do not propose to wait up until midnight for the convention's special delivery of 300 copies of that book, or to spend the small hours preparing myself for the Saturday programme items which -- from as early as 10am -- assume the entire audience will now have read it. Fortunately I don't have any Sectus obligations on Saturday. Phew.  A Significant Event To Be Expected At One Minute After Midnight Tonight [spoiler warning! spoiler warning! ]: In a final, traumatic and hideously irrevocable bloodbath, my own book dies the death. 14 July 2007 Catching up. At last I have a plausible draft for the Sectus 2007 speech -- I'm supposed to be talking there at 3pm on Friday 20 July, nine hours before The End of Harry Potter? reaches its foredoomed expiry date and the hapless author turns into a pumpkin. Gollancz brightly suggested that I should do a live interview with Channel 5 News very shortly beforehand (about HP and the Deathly Hallows, of course), but the mere thought induced terminal gibber.  Paul Cornell attempted to sabotage my working life by inviting me to join Facebook, which from my brief experience seems Very Strange Indeed. One is constantly being deluged with important status information about one's myriad "friends". "Fred Bloggs is badly in need of a pee." Momentous stuff like this.  An Ansible reader created a suitable pulp cover to go with that contribution from Ursula Le Guin, as linked below. 4 July 2007 It has been naughtily suggested that Ursula Le Guin's squib in the current Ansible could be nominated for the BSFA short fiction award. Although immensely tickled by this idea, I couldn't possibly comment. 30 June 2007 A package with an enormous number of Estonian stamps contains copies of my first (I think) appearance in that language, the short story "Teistsugune pimedus" in Arvi Nikkarev's hardback anthology Pilet Utoopiasse: something Utopia(s), or maybe Utopian somethings? I know what the story title ought to mean but would love to be enlightened about the anthology title.  Later: Mark Powlson tells me that pilet means ticket, so it's presumably Ticket to Utopia. And now I see that the lead story is Robert Sheckley's "A Ticket to Tranai". Aha! "That one word, my dear Watson, should have told me the whole story had I been the ideal reasoner which you are so fond of depicting." 27 June 2007 Today is a day of dither: shall I wander into London to meet old fan friends, or just stay here pounding away at my recalcitrant draft speech for Sectus 2007? That must depend on the weather.... [Later: yes, I went, and caroused in pubs with personages who in some cases I hadn't seen since the 1980s: Harry Bell and his partner Pat, Pat Charnock, Dave Cockfield, Rob Jackson -- who brought copies of his fanzine Inca 2, only 28 years after I'd contributed to the first issue -- Leroy Kettle OBE, Ian Maule, and Kev Williams.]  The postman brings a mysterious hand-addressed packet from Gollancz, containing two more copies of that paperback. No explanation, and I've already had my full quota of freebies, but perhaps the copyright page carries the intended message: despite the book's seemingly low profile in the UK, this is the fourth printing! 21 June 2007 Guy Kewney of The Register rips the lid off a certain Unauthorized Guide in "Harry Potter and the Pedant of CIX".  Just for the record, I saw a preview. DL to GK, 18 June: "Obviously (as you deduce) I'm in no position to issue real spoilers. Although I wickedly seized on JKR's 'don't buy' call to the fans, a dispassionate third party might consider it was Channel 4 News rather than the lady herself who linked her diktat to TEoHP." GK to DL: "Who am I to be dispassionate about it? :-)"
18 June 2007 Since the Josh Kirby Exhibition which opened on 16 June has a link to this site, here for visitors is the page about his and my A Cosmic Cornucopia -- which in turn links to other Kirby information and reminiscences here. 16 June 2007 The site access protocols at Hooting Yard are an example to us all.  Somebody actually asked me to explain Bush Custard Day, and I quoted chapter and verse here. 6 June 2007 Bush Custard Day.  Here, as a change from me, is a web page of my little brother's artwork. I was interested to learn from this that Leeds is in South Wales. 5 June 2007 There goes Ansible 239 ... in which there's a rather understated announcement (oh, I am so modest) of my part in the mass signing session at Waterstones, Piccadilly, London, on 7 June. Do come along between 5:30pm and 7pm. You will even be permitted to make that ever-fresh joke about rare unsigned copies, though (please) not more than once. 30 May 2007 I forgot to check the latest Independent on Sunday, not really thinking they'd use my letter niggling about the lordly editorial claim that a speculation currently in the news had never ever occurred to any SF author. This goaded me to write: It's generally unwise to state that a notion has never appeared in science fiction, and your third leader of 20 May makes this claim about robot nurses. One SF example is the redoubtable robot Ward Sister 5B who tends the last man on Earth in 'Second Ending' by Northern Irish author James White. This novel was published in 1962. Now Harry Bell reports that this appeared on 27 May, headed Sci-fi first and with a greatly improved second sentence: One sci-fi example of a robot nurse is the redoubtable robot Ward Sister 5B ... I'm tempted to write again asking why, in readers' letters discussing TV, football or food, they don't substitute easier-to-understand terms like "telly", "footy" and "din-dins".  PS: Yes, I could have dug up an earlier example, but I'd rather plug the late great James White than some mouldering obscurity like -- as Jim Linwood suggested -- David Keller's "The Psychophonic Nurse" from Amazing Stories, November 1928. 28 May 2007 It's taken days and days to deal with all the accumulated messages, ultimata and demands for urgent decisions that piled up while I was away. Oh well. The best news comes from Patrick Nielsen Hayden, who tells me that the Tor US edition of The End of Harry Potter?, which was reprinted within days of release, has now had a third printing that takes the run up to 75,000 copies. Glory, glory! Speaking of Harry Potter, it looks as though I'll be giving a talk at the Sectus 2007 Pottercon in July.  Further good cheer in the mail: the Russian hardback edition of Mike Ashley's Mammoth Book of Comic Fantasy, containing a translated Langford story and leaving me slightly puzzled about what intricate nuances of Western humour in my retro detective pastiche require 18 explanatory footnotes. 3 May 2007 Just in: a box of copies of that book in its Gollancz trade paperback edition, out on 10 May. Now I can ease my conscience by passing on a few of these to the readers whose feedback on the first edition led to tweaks and updates in this version. You know who you are. 2 May 2007 London again; the Clarke Award presentation; M. John Harrison carried off the prize for Nova Swing, which I reviewed last year in SFX. This is his first Clarke win. 23 April 2007 Suddenly it's International Pixel-Stained Technopeasant Day! 11 April 2007 To London again, for lunch with Rose Fox -- who's about to become reviews editor of Publishers Weekly -- and her partner Josh. No special reason: we'd just never met. After a short walk from our Chalk Farm rendezvous to Camden Town, I introduced them to Judith Clute and the wonders of the Clute flat and Clute cat (John, alas, was in the USA). Later: drinks in a Cambridge Circus pub with Avedon Carol and Patrick Nielsen Hayden. No special reason: Patrick had just flown in, not for the London Book Fair as everyone assumes but for business talks with Pan Macmillan ("Tor UK"). 6 April 2007 Time for a whirlwind trip to the Eastercon in Chester, where I have a tight schedule of being in the bar. As stately mementos of a gracious and almost forgotten past, paper copies of Ansible 237 will be available -- at least until Sunday afternoon, which is as long as I can stay around. 5 April 2007 Patrick Nielsen Hayden sends the first Tor/Forge email newsletter, containing an interview of vast cosmic insignificance. 4 April 2007 To London and the Cartoon Museum in Little Russell Street, for the long-awaited launch of Bryan Talbot's very unusual graphic novel Alice in Sunderland. Things to gape at in the Museum: a full-sized Rowland Emmett golfing machine chugging endlessly away behind glass; originals by Max Beerbohm and other names to conjure with; and of course ever so many pages from Bryan's 320pp extravaganza. Our artist looked deeply euphoric; Jordan Smith, who did the jacket, bragged "That's my daughter playing Alice on the front"; Neil Gaiman made a surprise appearance by way of time off from his 5,271,009th signing tour; others of the (relatively few) usual suspects included Roz Kaveney and -- shrouded in sunglasses after a cataract operation -- Molly Brown. I swooned on being introduced to Steve Bell. 29 March 2007 This morning, for the first time, I saw the 2007 Hugo shortlist -- not (as usual) in email from the Worldcon, nor on the Nippon 2007 website, but at Making Light. Apparently the news leaked from a collation session at NESFA, for a mailing that included copies of the ballot. Anyway, though it's great to be nominated (thanks to all!) it's also good to see a bit of upheaval on the fan writer front: here's fellow-nominee John Scalzi on the subject. Strange, as he says, that Japanese fans didn't contrive to vote a single local candidate into any Hugo category. I still remember the British excitement about an influx of UK nominees before the Brighton Worldcon in 1979 (my very first listing, although I didn't win)....  Later: Patrick Nielsen Hayden explains how the information got out. 19 March 2007 A Guardian blog posting on the recurring Ansible newsletter theme "As Others See Us" has sprouted a comment link to this site. If you're looking for such material, it's in the Ansible archive rather than this page. Here's a selection via Google.  Later: I've adapted the Thog-o-Matic Random Selector to provide a similar random dip into the "As Others See Us" department: here. 11 March 2007 Langfordian efficiency seems to be at a low ebb this month. At least I finally pulled myself together enough to book a room and rail tickets for Contemplation, the 2007 Eastercon in Chester -- or part of it, from Friday afternoon to Sunday lunchtime. Expect to find me in the bar.  Martin Rowson's take on the lunar eclipse is sufficiently horrific. 16 February 2007 Ooh, what on earth did I do last night? It must have been the Orion/Gollancz author party in London-- another amazingly lavish affair. 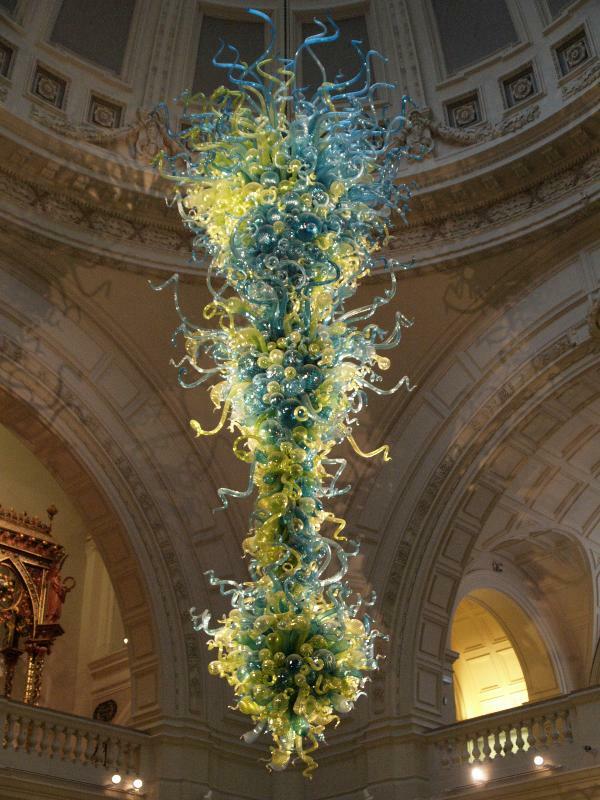 This year's traditional exotic venue was the foyer of the Victoria & Albert Museum, with champagne flowing freely beneath the eldritch presence of the Chandelier of Cthulhu.... As the evening wore on, this artefact definitely seemed to writhe. Approaching the V&A with half an hour to spare, I instinctively checked the South Kensington pub where sf people used to gather before Clarke Award events at the Science Museum. This was strangely devoid of the usual suspects, but Rob Holdstock arrived thirty seconds after me, shortly followed by David Garnett, Chris Priest and John Meaney.  If I try to drop all the names noted at the V&A, hideous omissions are inevitable. Familiar faces on the Orion publishing side included Malcolm Edwards, Jo Fletcher, Gillian Redfearn, Simon Spanton, and Jon Weir. Thanks for all the bubbly....Among the auctorial lowlife were Steve Baxter, Steve Jones, and Roger Levy. Vadim Jean was making little happy noises about directing another Discworld film in the wake of Hogfather -- this time, a mix of Terry's early books The Colour of Magic and The Light Fantastic. (Me: "Is this where Anne McCaffrey sues?" He, cautiously: "We're not going to use very much of the first book....") Celebrity gaped at from afar: Leslie Phillips. Rob Holdstock swears he sighted Helen Mirren during a surreal phone conversation with the Guardian, to which he'd written a letter (of which more in the March Ansible): "I was called in the middle of the Orion party to confirm that I had indeed written to El Grauniada, and was not in fact someone posing as me, and that he was considering my letter for publication. Christ knows what I said to him. Something burbled, no doubt. Champagne had flowed, it was noisy, and Helen Mirren (Elle Divino) was in my sights, though I eventually decided not to embrace her in my arms. It would have been an undignified moment of swooning. (MY undignified moment, you understand.) So I shook hands with Leslie Phillips instead." I, conversely, didn't. 13 February 2007 I tend to be curmudgeonly about link requests arriving out of the blue (the Ansible links page is not intended as an all-inclusive list of every sf site there is), but when the BBC asks me to reciprocate its link, I instinctively touch my forelock and obey....  Much gloomy preoccupation here. Some cheer was brought by encouraging email responses to this month's Ansible -- appreciated even when they're not hot news for publication. And perhaps I'll pull myself together enough to visit Picocon this weekend. 4 February 2007 Many thanks to Locus Online for pointing out this SF Site review! (Honesty compels me to note that we also get reviews like this.)  The February Ansible went out yesterday and was duly announced here. 3 February 2007 A timely rant about this month's notable centenary. 31 January 2007 Here is a slightly different kind of appreciation of that book (scroll down). Naturally I begged permission to quote this valuable commentary in the little puff-piece I've been asked to prepare for the coming Tor newsletter. 20 January 2007 To London for the Clarke Award shortlist announcement, preceded by distractions in a different pub (I ran into Ian Watson right next to the Pillars of Hercules) and a restaurant (Jimmy's, with Chris Priest and Leigh Kennedy added to the party). Vaguely surprised that the Clarke organization, which always seems to be desperately raising funds to stay afloat, managed to lay on free drinks for its own pub event. Good for them! And the shortlist is: End of the World Blues by Jon Courtenay Grimwood (Gollancz); Nova Swing by M. John Harrison (Gollancz); Oh Pure and Radiant Heart by Lydia Millet (Heinemann); Hav by Jan Morris (Faber); Gradisil by Adam Roberts (Gollancz); and Streaking by Brian Stableford (P.S. Publishing). No doubt we will soon be hearing why the judges should have picked an entirely different slate. To everyone's astonishment, this year's prize money has been boosted to £2007. 18 January 2007 Last Sunday I noted with quiet smugness that I was (again) a runner-up in the Indy on Sunday prize crossword, and thus doomed to receive another copy of the Concise OED. Imagine our surprise next day when a huge box arrived, containing a whole stack of Oxford reference books including the rhyming dictionary. (Hadn't seen that one before -- it's actually organized by rhyme, rather than just being in alphabetical order of reversed spellings like Walker's Rhyming Dictionary, whose monumental uselessness once inspired Thomas M. Disch to denounce it in a poem.) "They must have made a mistake," we giggled: "That's the first prize, not the runner-up!" Today, though, came another parcel containing the Concise OED and nothing else. Blimey, it seems that I won first prize in the previous week and failed to notice.... Well, these things impress my mother if no one else. 15 January 2007 Although it's been requested by a grand total of one reader, I feel too lethargic to hand-maintain another RSS feed (like Ansible's) to supplement or replace the updates page here. But my ISP recently added a WordPress weblog facility, and by way of experiment I'm currently using this for update notices at davidlangford.co.uk. Please don't all sneer at once. 12 January 2007 Today I emailed my corrections and updates for the Gollancz paperback and Tor US versions of that book. A few new paragraphs went in (one inevitably recording the announced title of Potter the Seventh), plus an extra credit to Barry Arrowsmith for useful feedback, but there are no sweeping changes. 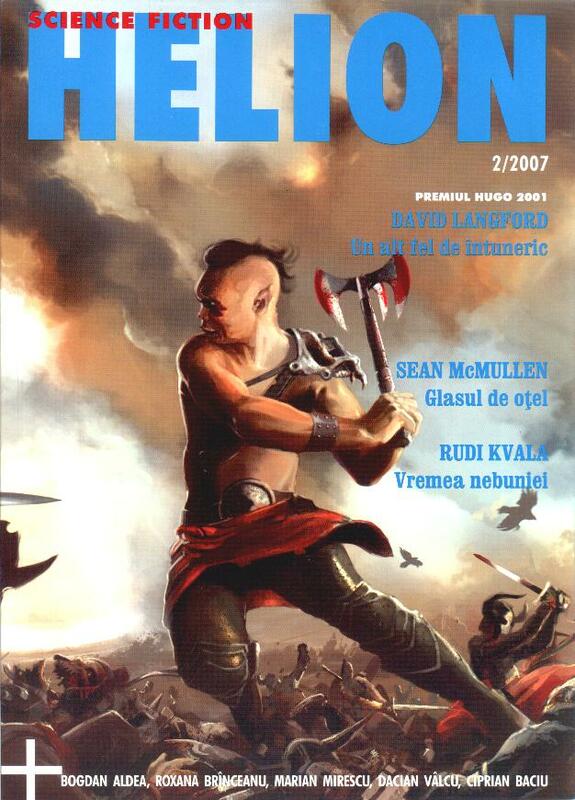 11 January 2007 Despite Gollancz comments on 9 January (below), it emerges that the great Patrick Nielsen Hayden has made an offer for that book -- so, if all goes well, a US edition can be expected from Tor. This is cheering.